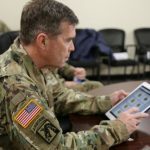 WASHINGTON (Army News Service, Oct. 21, 2014) – As the Army stands up its Cyber Branch, the service is stepping up recruiting for its cyber force. Lt. Gen. Edward C. Cardon, the commander of U.S. Army Cyber Command, sat down with reporters here, Oct. 13, at the Association of the United States Army’s Annual Meeting and Exposition to discuss the development of the command and cyber security initiatives. The last branch to be formed in the Army was the Special Operations Branch, which was formed in 1987, Cardon said. 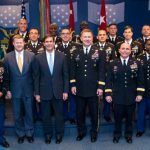 The new Cyber Branch will be headquartered at Fort Gordon, Georgia, with construction of the command’s headquarters to be complete within the 2018-2019 time frame. New construction will include the Cyber Center of Excellence, which will house the Signal and Cyber schools under one roof. 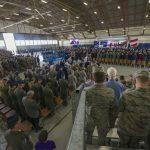 The headquarters will be co-located with the National Security Agency at Fort Gordon, but will remain a separate entity, Cardon explained. Recruiting for the new branch has gone well, with the best luck initially being in-service recruiting, though now cyber is looking to branch out. Cardon explained they are looking for “super coders”– people with innate understanding of computer code — to help fill the ranks, on the advice of other technological giants like Amazon and Google. Currently, recruits have to undergo the highest testing standard in the Army, Cardon said, with most passing the assessment test between 60-80 percent the first time. To have the cyber force complete by 2016, all billets must be assigned by next summer, he explained. Having the nation’s best minds working for cyber will help to mitigate the different varieties of threats that the Army is facing in cyberspace. Cardon characterizes potential threats in three ways: sophistication and number, vulnerabilities, and barriers to entry. The number and sophistication of cyber threats are on the rise, Cardon explained, citing organized hacking groups like Anonymous. “At the same time vulnerabilities are dropping, the two most recent examples are Heartbleed, and now Shellshock. Those are the most recent — these are existing problems in code that create huge vulnerabilities,” he explained. “And the third characterization is barriers to entry are dropping. In other words, 20 years ago if you wanted to do this, you had to be a hardware expert, a software expert. Now you can go on the web and you can download packages,” he said. 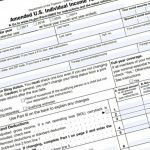 It’s now easier for individuals and groups to hack networks because of the availability of “how-to” information. The digital landscape is very different from when cyber first formed, and he said the Army must adapt to new and emerging threats. “If you want to build the strongest network, you better understand how it’s being attacked,” Cardon said. Even though cyber is being challenged during it’s development, it is still moving forward to encompass the total Army. 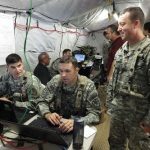 Cyber has been working with the National Guard and Reserve to stand up their own cyber mission forces. Company commanders today have as much access to command and control as a division commander 10 years ago, Cardon said. He believes it is important to leverage cyber throughout the Army.